Whenever we hear the term Syringoma we automatically associate it to those unsightly benign formations around the eyes that people try and cover up by using camouflage makeup. When the same sweat duct superficial growths appear on other parts of the body they are commonly referred to as Eruptive Syringomas. They can appear on the forehead, armpits, neck, belly and almost any part of the body. Like periorbital Syringomas they are completely benign and they are only removed for cosmetic reasons. Eruptive Syringomas do not cause any discomfort and are not as dangerous as such. Generally, when it is referred to Syringomas, we refer to the periorbital benign formations, those around the eyes. Generally, when they appear other parts of the body they are referred to as “Eruptive syringomas”. 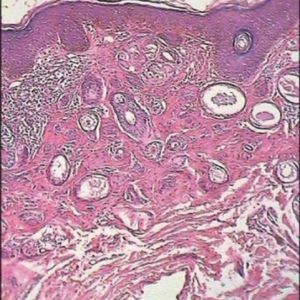 Eruptive Syringomas can appear almost on any part of the body however they have been rarely found on the genital area, although some authors maintain that those pubic syringomas should be considered as a differential diagnosis of pubic pruritic papular dermatitis. Syringomas are benign adnexal tumors of eccrine origin, with four principal clinical variants. In eruptive syringoma, a rare variant first described by Jacquet and Darier in 1987, the lesions occur in large numbers and in successive crops on the anterior chest, neck, upper abdomen, axillae, and the periumbilical region at puberty or during childhood. More rarely, cases with wider involvement of the body have also been reported. It occurs more frequently among women. The lesions consist of asymptomatic multiple small firm yellow-brown-colored papules, that typically present in a bilateral, symmetrical distribution, but there have been reports of the unilateral, unilateral nevoid, bathing trunk and generalized distributions. The lesions are benign and may spontaneously resolve, or, more commonly, remain stable. Treatment of this benign condition is cosmetic only. Clinically, it may be mistaken for acne vulgaris, sebaceous hyperplasia, milia, lichen planus, eruptive xanthoma, urticaria pigmentosa, hidrocystoma, trichoepithelioma and xanthelasma on the face and granuloma annular on the trunk. 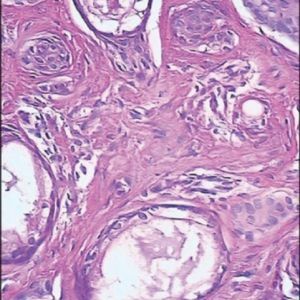 Definitive diagnosis can be made on histological examination because syringomas demonstrate distinctive histopathological features. It is corroborated that the condition could be triggered by waxing Source. Depilation could induce a subsequent reactive inflammatory process resulting in a hyperplastic reaction of the eccrine (sweat) ducts. According to a recent study in one case the suspect cause of the triggering of the condition was the use of antiepilectic drugs. Unfortunately once they appear they stay for the entire lifetime of the individual unless they are removed. 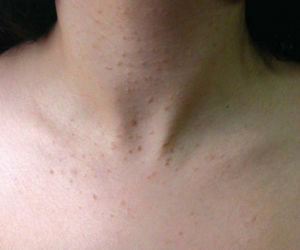 Eruptive Syringomas present themselves as successive crops of small flesh-colored papules on the anterior body surfaces. It generally occurs in the peripubertal period (Preteen). Treatment of this benign condition is cosmetic only also because eruptive Syringomas do not generally cause discomfort. Eruptive Syringomas was first recognized by Darier and Jaquet in 1887. Although eruptive syringomas can develop on various sites of the body, instances of widespread involvement, known as generalized eruptive syringoma, are rare. Eruptive syringomas can appear abruptly in adult life, as a crop of multiple lesions typically on the chest or lower abdomen. Most people with eruptive syringomas are Asian or dark skinned.